Good quality Danger Venomous Snakes stickers. Approx 100mm x 120mm.Minimum order 3 for $15, inc..
Good quality Danger Venomous Snakes stickers. Approx 50mm x 70mm. Minimum order 5 for $1..
As new, robust, portable funnel trap with full length zip. Collapsible. 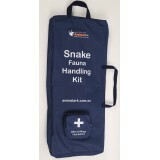 Measures 79cmx18cmx18cm ..
Snake avoidance training for dogs. Simple, effective training to keep your dog safe, and save..
Snake avoidance training for dogs - REFRESHER SESSION. Simple, effective training to keep you..